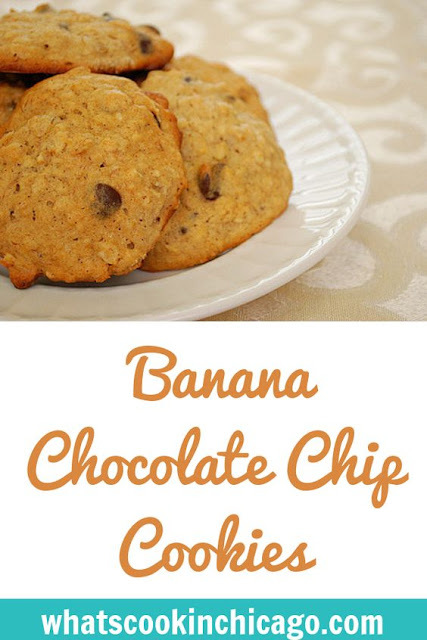 I've made banana cookies in the past and have yet to find one that's more crispy than cakey. This recipe was described as a bit crispy, especially when enjoyed the same day as they were baked. But they soon lose their crispy appeal and are probably better described as banana muffin tops. At least, that's what the reminded me of. It's a good thing I enjoy muffin tops so I really enjoyed this recipe. Sift the flour, oats, baking soda, cinnamon and salt together. In a stand mixer, cream the butter and sugar until light and fluffy. Add the egg and vanilla and mix until combined. Add half the flour mixture, mix, and then add the banana and mix. Add the rest of the flour mixture and mix until combined. Mix in chocolate chips. Drop tablespoon-sized balls onto the prepared baking sheets. Bake in the preheated oven for 12 to 14 minutes, rotating halfway through. I love bananas and chocolate chips together. 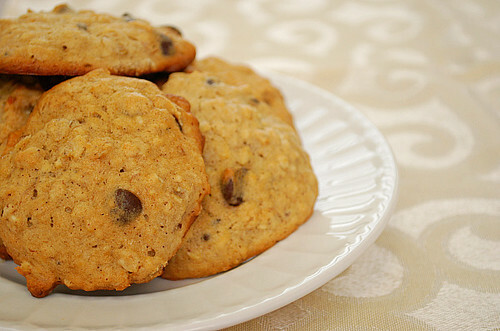 I have made muffins and bread, but never cookies so I'll have to try these - they look great!